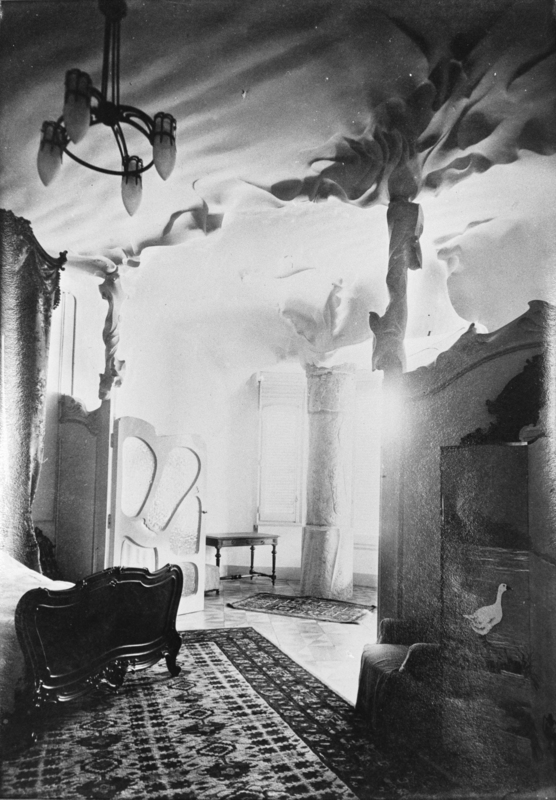 The main floor of La Pedrera, which has housed the Foundation’s exhibition hall since 1992, was originally the residence of the Milàs. The floor retains little of Gaudí’s décor because Roser Segimon, Mr Milà’s wife, had most of it changed after the architect’s death in 1926. However, we can still see a few ornamental motifs and inscriptions carved into some of the stone columns, as well as sections of the original plaster ceilings designed by Gaudí to give continuity to the undulating rhythms of the building’s façade. The photograph shown here comes from the archive of photographer Joaquim Gomis, who also collected photographs. It appears alongside a text by Michel Tapié, in Gaudí-La Pedrera, a volume in the series “Fotoscop de Gaudí” (Polígrafa, 1971). The book also includes other images from various archives and original photographs from Joaquim Gomis’ archive whose origin is not specified. This image shows part of the ceilings and interior décor that were destroyed during the alteration work. It is remarkable that, although previously published, the photograph went largely unnoticed until now. The plaster ceilings, and the partition and mouldings attached to them, give us an idea of what some of the rooms of the owners’ 1.300 m2 apartment looked like. We supplement this small find with a budget drawn up by La Pedrera’s builder, Josep Bayó. 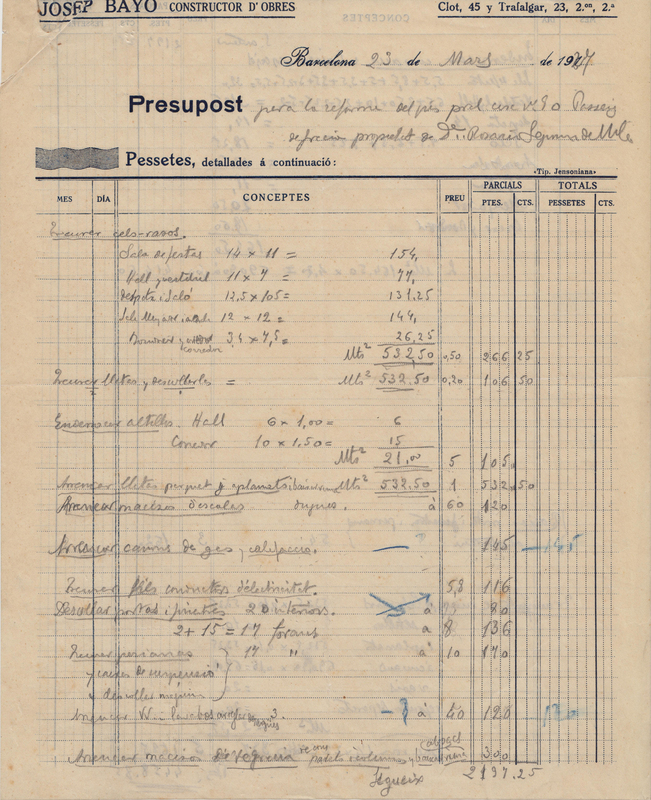 On 23 March 1927, Bayó handed Mrs Milà these documents, specifying the alterations to be carried out. The foremost Gaudí expert, Joan Bassegoda, refers to them in an article published in La Vanguardia on 12 December 2001, and here we are able to show the original documents, which are kept by the Gaudí Chair Gaudí Chair at the Universitat Politècnica de Catalunya · BarcelonaTech (UPC). The commissioned work consisted in demolishing 532.50 m2 of undulating ceilings and carrying out alterations designed by the decorator Modest Castañé i Lloret. These alterations affected the function hall, hall, vestibule (and their corresponding mezzanines), office, living room, dining room, bedroom and corridor; both the parquet flooring and the blinds were removed and 20 doors and windows were replaced. “Budget for works to be carried out on the main floor of the residence of Mrs Rosario de Milá. Knock down mezzanine floors, plaster ceilings, remove supports from the floor-ceiling, remove parquet flooring underlayment, knock down hall staircase, remove plumbing and wiring, tear down all partitions, carry doors and windows to the basement and remove rubble. 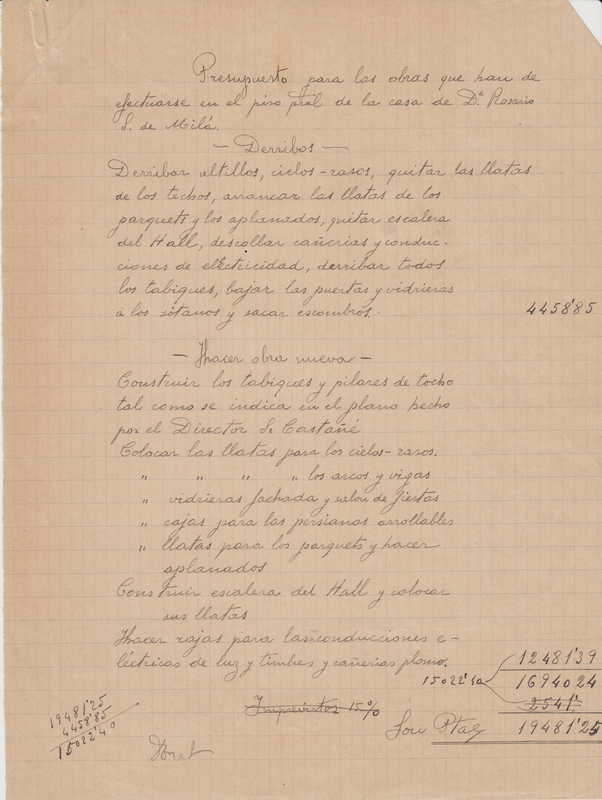 These documents, published for the first time, record the date and the extent of the destruction of the original Gaudí décor to the main floor, and allow us to identify the different rooms. We will continue to search for more images of the interior, with a view to reconstructing the entire main floor.